The Zen Ultraphone U1 is an Android enabled budget dual–sim smartphone that comes with a handy 3.5 inch High definition capacitive touch screen and is equipped with a 1 GHz processor to power all your processing needs. It also boasts of a 3.2 megapixel camera with LED flash and an internal memory of 512 MB, expandable up to 32 GB. 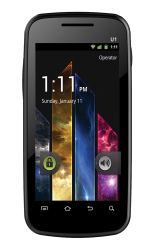 The Ultraphone U1 comes with a 1200 mAh Li-on battery and runs on the Android 2.3 Gingerbread OS. The interesting thing to note is the fact that the phone lacks 3G connectivity, however, there is Wi-Fi and Bluetooth support.